Exquisite Art Deco Diamond & Ruby Cluster Ring [SH10017] - £3,750.00 : loveVintageDiamonds.com, Your Vintage Diamond Dreams Come True! This ring epitomises everything that is wonderful about the Art Deco period for jewellery; an old marquise-cut diamond in the centre of the ring, weighing approximately 0.80cts, is in a collet-setting and surrounded by 12 small fancy-cut rubies. At either tip of the marquise-cut is a gorgeous old pear shaped-cut diamond, each weighing approximately 0.55cts. 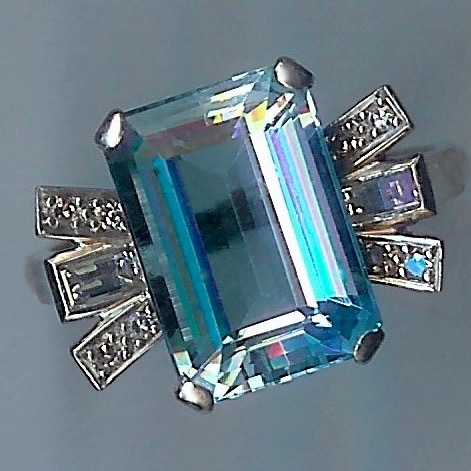 There are a further eighteen old-cut diamonds in this ring, taking the total number of stones to thirty-three and the total diamond carat weight to approximately 2.30cts. The ring is white throughout, '10%IRID.PLAT' to indicate that it is platinum with 10% iridium, typical of its age, and it tests as platinum. The overall weight of the ring is approximately 5.1gms and it currently fits finger size 'K'/2' (UK) approximately.